Fast-moving and hilarious, this recent pantomime version sets new standards for the famous title. This inspirational new script brings Beauty & the Beast well and truly into the realm of traditional panto, whilst being packed with originality and comedy to die for! Many new twists are turned along the way, ensuring a side-splitting and action-packed adventure, together with some dramatic and tender moments. Several imaginative new characters provide added laughter, in addition to an unusual visual comedy scene in the Beauty Parlour, guaranteed to bring the house down! Belle’s two outrageously common sisters provide rare comedy roles for women and the principals and Chorus remain fully involved throughout the story. Many productions of this script have won NODA and drama federation awards, including Kinver Light Operatic Society, The Performing Arts Company, Leighton Buzzard Drama Group and The Bolsover Drama Group (all of whom won NODA “Best Pantomime”)! Guess what – I’ve talked Daddy into paying for us to go the beauty parlour again. Ooh, what can we have done to make us even more ravishing? Here come Marcel and Monique from the Salon. Let’s see what they suggest. Hi-ya, babes! Britney, was that mudpack any good for yer face? Yeah – it improved it no end … until the mud fell off! Last time you came in you bought some blackberry body lotion. Yeah – and our mango moisturiser. So, what can we sell you this week? How about something to keep the wasps away? (Calling over to Belle) How about you, Belle? Do you wanna come? What are you asking her for? Well, she needs it more than us! Oh, no thanks – I prefer the natural look … and Papa really can’t afford it. Just you two, then. Cool, babes – sorted! I say, Sis, I hear a new hunk has moved into the village. Gustave? Yes – he’s got quite a six pack! Ooh, good – ‘cos these fellas out here look more like they’ve had a barrel-full! Hey there, ladies. (Aside to audience:) And I use the term loosely! See the effect I have on women? With my looks, I just can’t help it! Watch this. (Spotting Belle) Hey, look at her over there! What’s your name, lover girl? If you must know, it’s Belle. Well, ding dong! … Why, you’re as pretty as Cinderella! (Trying to get his attention) And what about us? Yeah – we’re her sisters! Cinderella’s sisters, eh? That figures! DANCERS: Featured in musical numbers as desired. Also play the wolves/ghouls of the Forest and perform the optional ultra-violet number. The pace rattles through quite briskly, but there’s still room for some traditional scenes, such as the ‘I’m not here’ routine and a trip to the Beauty Salon for the Dame and the comedy Sisters. Plus, of course, an ‘it’s behind you’ scene. It’s not always easy to establish who the baddie is in ‘Beauty’, but here the duties are spread between the Sisters, Gustave and Belladonna, the wicked enchantress. Gustave and the Sisters are suitably punished by ending up with each other! As well as the music, there are also detailed suggestions and notes to help with the staging. There’s a props list, detailed notes on set design and suggestions on how to build the specialist props – it’s all there to help. No-one is going to say there isn’t enough supportive info here, or that they were left not knowing what to do! 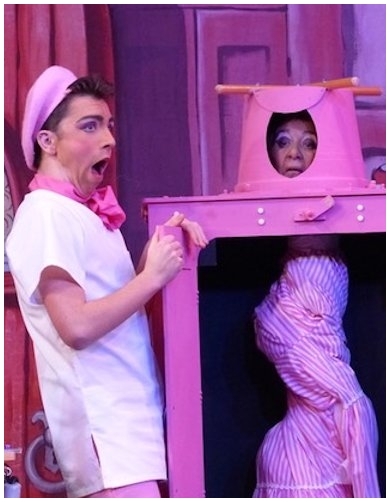 "...If I could describe this panto in one word it would be EXUBERANT! It was great fun and went along at a very good pace." "...This is the tenth Alan Frayn pantomime that we have produced. It's a brilliant pantomime adaptation of the traditional story with the biggest ever helping of comedy from all of Alan's new characters and situations. When we first read it, most of us were simply crying with laughter! We couldn't wait to get it into rehearsal. Who would have dared to include a beauty parlour in the middle of Fairyland where even the Beast himself can get powdered and pampered by its two hilarious owners? This has been our greatest adventure yet, Alan. Thank you so much for giving us the opportunity to make so many people smile." "...I am particularly impressed with this Beauty & the Beast script as there are more comedy roles for women than usual. The sisters and Monique are excellent parts. So many pantomimes concentrate on the male comedy acts and the women are often sidelined!" "...A script loaded with gags. This panto was exactly as it should be with local people of varying ages enjoying the experience."